Welcome to Week 21 of the One Yard Wonders Sew Along! Tracy Selected Martha Negley Flower Garden Two Tone Brown and Free Spirit Designer Solids Mulberry Wine. 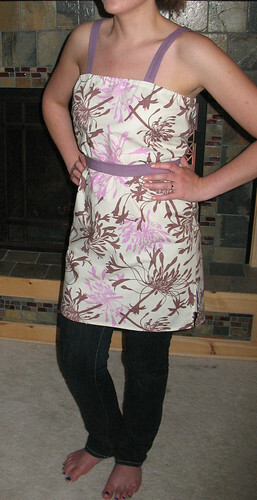 Tracy got to sew another project designed by Sharon Madsen, and again found her instructions clear and easy to follow. The first Sharon Madsen project was the Two Drawer File Cabinet Cover in Week 5. The top is super simple to sew. Basically a rectangle, with 2 side seams and an elastic casing at the top. The pattern has the top front cut with a slight curve on the sides, Tracy did not use a french curve. She just drew it on one side as per the easy-to-understand illustration, then folded the piece in half to cut both sides at once. The sizing seemed pretty true…easy to measure for and since it’s not fitted it doesn’t have to be precise. Tracy used lingerie elastic. The regular elastic she had was heavy and the softer look of a softer elastic seemed like a good choice. But it was a little too soft. Pink Chalk Team Member Jacqui sews a lot of clothing, and suggested swim suit elastic would be nice and soft but have a bit more body. Straps and a belt were done in a coordinating fabric. This tunic can be worn over pants or leggings. It would also make a good swim suit cover up, sewn out of a knit or terrycloth. 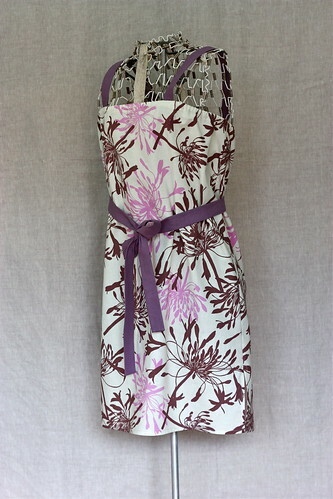 Here is a link to Sharon Madsen’s blog with another fun idea for this Tunic…Lace! 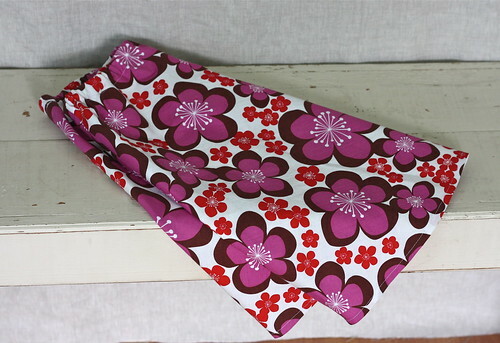 Carrie chose 2 yards of Nancy Mims Pick a Bunch Mixed Bouquet Orchid – Organic cotton. optional trim for bottom edge of skirt. The Bias Skirt was Carrie’s first clothing project. She found the directions easy to follow and was pleased with the results! The Materials list did cause a bit of confusion. The pattern was designed for 60″ wide nondirectional fabric. Most quilting cottons come in 44/45′ width. Carrie had already cut a single yard of quilting cotton and then discovered a second yard was needed as the fabric was not wide enough. Ultimately she was pleased with the fabric selection. The organic cotton has an incredible feel and the scale of the pattern was perfect for the skirt. When determining the size Carrie found the waist measurement and hip measurement did not fall on the same size on the chart. She chose the larger of the two pattern sizes. The skirt was a perfect fit. It was surprising (to a real beginner on clothes) how easy it was to fold down the waist band for the casing and complete the hem with fabric cut on the bias. The Bias Skirt is a perfect project for a beginner. It takes just over an hour from beginning to end. A great skirt for a sunny day!